When it comes to bar stools, Kartell are the manufacture of choice. Great designs, coupled with superlative quality is what makes them so popular with our customers. We have a range of Kartell stools for you to choose from… different sizes, colours, and prices too… so we’re sure you’ll find something to suit your home or bar. Designed by well-known designers Antonio Citterio and Toan Nguyen for Italian company Kartell, this amazing stool brings the height of sophistication to any bar. With a wide moulded seat, it’s extremely comfortable and the stool has an inbuilt gas lift pump so the height can be adjusted to suit your needs. The curved central support is reinforced for added strength, so its functional as well as beautiful. Contemporary, but with vintage heritage, the Charles Ghost is carved from a single piece of acrylic. This means it’s virtually indestructible… shatterproof, chip proof, and weatherproof. This stool is perfect for outside bars, yet the stylish deign makes it equally at home in the kitchen counter or breakfast bar. 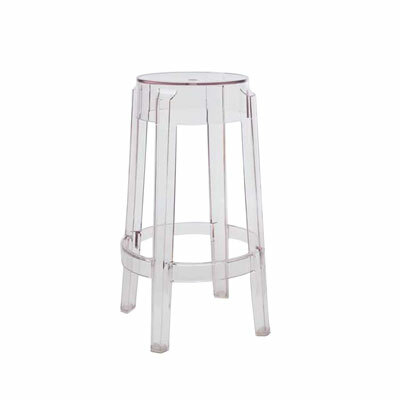 The Charles Ghost comes in three different heights, small, medium and large, so if you’re looking for Kartell Bar Stools you’ll need the large version at 75cm in height. This hourglass shaped stool is lower in height than the previously mentioned Kartell Bar Stools, and is perfect for seating around the tables in your bar area or cocktail lounge, and the weatherproof finish makes it suitable for use inside or out. Available in a range of pastel colours such as Fennel Green, Wax White, Lavender, Orange, and Pigeon, the Prince AHA stool will add a subdued touch of colour where you need it. As with all our products we aim to be the most affordable place to buy online. If you see a piece cheaper elsewhere get in touch and we’ll match it.